noticeable asset of this area is the beautiful farmland. You can find every crop here, depending on the time of year. Peanuts, cotton, soybeans, wheat, sorghum, corn, pecans, fruits, leafy vegetables, squash and others are grown in the rich soil of south Georgia. Barwick is attracting many new residents who enjoy the laid back, friendly lifestyle of the area. Although improved roads and transportation long ago sent major retail business to the larger community of Thomasville, Barwick is fortunate to have many successful farms and other companies, including B.Lloyds, a gourmet pecan and gift company with over 100 years in the business. Jack and Fran Miller are in the horse business. Jack is a farrier for the plantations and is known for his expert shoeing services. Messer Dairy gives passersby a glance into the peaceful, pastoral lifestyle of a working farm. Barwick is a community of unique personalities and businesses who work together and look for opportunities to serve their neighbors. 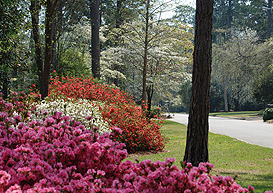 You are invited to take the short drive from Thomasville, look around and meet the people.